Cobblestones01263 733626work Self-cateringCosy single storey accommodation. Living room with wood burner stove and stable door to garden. Kitchen/breakfast area. Bedroom with one double and one single bed. To sleep up to 3 people. Shower room, heated throughout. 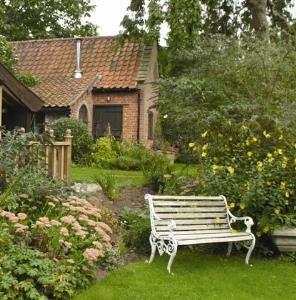 South facing summerhouse in garden. Barbecue. Weekly lets Saturday to Saturday. Arrival from 3pm. Short breaks may be available outside peak season. Cosy single storey accommodation. Living room with wood burner stove and stable door to garden. Kitchen/breakfast area. Bedroom with one double and one single bed. To sleep up to 3 people. Shower room, heated throughout. South facing summerhouse in garden. Barbecue. Fridgerator within freezer compartment and full calor gas cooker in kitchen. Children welcome from age 10. From Aylsham market place take the B1354 towards Blickling Hall. Petersons Lane is the third turning on the right - approx one third of a mile. Gardeners Cottage and Cobblestones is the first property encountered on the left hand side of the lane. Hourly bus service from Norwich to Aylsham market place. Property is 5-10 minutes walk from market place through church yard.